(St. Deiniol's Residential Library) was founded in 1889 by the Rt. Hon. W.E. Gladstone; and the magnificent building which now houses the Library was erected as a national memorial to him. Mr Gladstone intended that the library should be "a haven where men and women of 'any faith or none' could stay to read and study". It is believed to be the only one of its kind in the world. Flintshire - Bibliography - Books of General Interest for Family Historians. Flintshire Record Office holds microfilms of the original census returns for the whole of the former county of Clwyd (which includes "old" Flintshire), and for some adjoining areas, from 1841 to 1891. There are occasional gaps, particularly in 1861. For a few parishes, lists of names which were made in connection with the census returns prior to 1841 have survived, and have been deposited in the Record Office. Members of Clwyd FHS participated in the 1881 Census project - in fact, the first counties to be published were Flintshire and Denbighshire, in 1991. Copies of the microfiche for Flintshire and Denbighshire are held at Flintshire Record Office, and at many LDS Centres. Historically, the (Anglican) Church in Wales was an integral part of the Church of England - i.e. the "Established" Church. Its influence declined during the nineteenth century, when a considerable proportion of the people of Wales - perhaps more than half - became adherents of the various nonconformist denominations; and eventually, in 1920, following many decades of religious and political debate, and intermittent civil disturbances, the Church in Wales ( not"Church ofWales") was disestablished and disendowed - i.e. it ceased to be the "State" or "Established" Church. Because of this, the Parochial Registers and Records Measure of 1978, regarding the care of parish records of the Church of England, does not apply to Wales. However - in 1944, the Representative Body of the Church in Wales showed considerable foresight, by making an agreement with the National Library of Wales whereby various Church records would be deposited in the Library; and in 1976, the Representative Body reached an agreement with the majority of the Welsh counties, which designated the county Record Offices as additional suitable repositories. The Archbishop of Wales issued instructions as to which records should be deposited, and appointed Diocesan Advisors to ensure that his instructions were followed. Virtually all parish registers for Flintshire (with the obvious exception of those in current use), together with various other records, have now been deposited in Flintshire Record Office and/or the National Library of Wales. Contrary to erroneous statements which have appeared in a recently published reference work, the records which have been deposited do include almost all the surviving registers of the parishes of Maelor Saesneg ("Flintshire detached"). Members of the public are not normally allowed to handle the original registers. The policy of the Flintshire Record Office is to microfilm the registers on receipt; and members of the public are expected to use copies of these microfilms, rather than the original registers, in the Record Office searchrooms. Clwyd Family History Society has published full transcriptions, with indexes, of all the parish registers of Flintshire, up to 1812 (and in a few cases, up to 1837 and beyond). Copies of all the transcribed parish registers published by Clwyd FHS are available for study at the Flintshire Record Office. Here is detailed information about the "historic" Registration Districts for Flintshire, which came into being on 1 July 1837. Here are the addresses, telephone numbers, opening hours, etc. of the present-day Registration Districts which hold records for "pre-1974" Flintshire. North Wales BMD is an on-going project which aims to provide an easy search facility via the Internet for births, marriages and deaths recorded in the North Wales Register Offices between 1837 and 1950; and to enable researchers to order copies of the certificates from the local Register Offices. Barbara Dixon (who is a Superintendent Registrar) has compiled an excellent Tutorial about Birth, Marriage and Death Certificates in England and Wales. (Note - you will leave the "GENUKI environment" when you link to this Tutorial). Deeside.com & Wrexham.com - "Independent local news, reviews, information and forums"
Over 33,000 names of persons listed as living in North-East Wales have been extracted from these directories; and indexed in the general index of persons which is held in the Record Office. The County of Flint came into existence in 1284, when following many years of warfare, Edward I proclaimed the Statute of Wales at Rhuddlan. At that time, the new county consisted of three separate areas, which were Englefield, Hopedale and Maelor Saesneg. In 1536, Henry VIII passed the Act of Union, which decreed that Wales should be incorporated into the kingdom of England. He also decreed that all areas of land which had not, until then, been included in a county should either be made into counties, or be added to existing counties. Following this decree, the lordships of Mold and Hawarden, which had separated Englefield from Hopedale for two and a half centuries, were initially added to Denbighshire. However, in 1541, it was realised that this was an unsatisfactory arrangement, and these lordships were transferred to Flintshire. The two small townships of Marford and Hoseley, to the north-east of Wrexham, became a detached section of Flintshire. Maelor Saesneg remained as the other detached section. With minor adjustments, this was the format of Flintshire for the next 435 years, until the "reorganisation" of 1974. Flintshire Record Office has a computerised catalogue of estate maps, from the early seventeenth to the late nineteenth century, which is available for reference in the search room. It includes over 900 entries. Separate lists and indexes of tithe and enclosure maps are available. Flintshire Record Office holds Shipping Records from 1863 to 1913, which include lists of the crews of ships trading from Flintshire ports on the River Dee. Two bound volumes of indexes to these records (about 30,000 names) are available. Flintshire Record Office has a card index, known as the County of Flint War Memorial, which gives details of more than 10,600 Flintshire men who served in the armed forces during the First World War. For each man, the index has his home address, his unit, rank and number. The index may also provide further details such as postings, wounds, and (if he was killed in action) the circumstances, the place of burial, etc. Flintshire Record Office has a printout of its computer-based general index of persons. The references in this index, in general, point to a further set of lists and / or indexes, which in turn point to the original source. (Names of persons in parish registers are not included). The Flintshire Record Office holds additional original copies of newspapers, but unfortunately they cannot be made available to researchers because of their extremely fragile condition. There are no funds available at the present time to microfilm these newspapers. "Clwyd Historian" is published twice each year by the Friends of the Clwyd Archives. It is devoted to the local history, archaeology, biography and antiquities of the counties of Flintshire and Denbighshire. "Hel Achau", the journal of Clwyd FHS, is published four times each year. Flintshire Historical Society publishes an annual journal. The records of the Holywell and St. Asaph poor law Unions, from 1837 to 1930, are held at Flintshire Record Office. They include registers of admissions and discharges, and of births and deaths. The records of the Hawarden Union, from 1853 to 1930, are also at the Record Office, but they are much less complete. 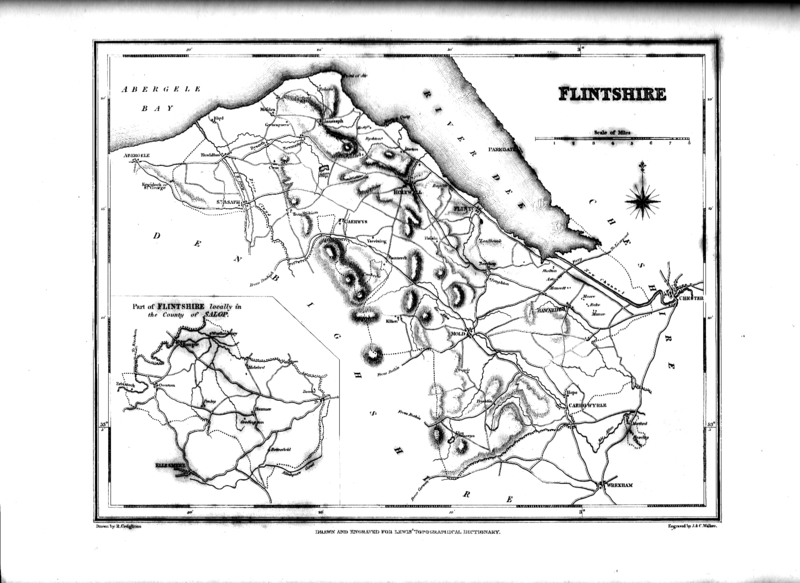 In 1801, the population of Flintshire was 39,469. Flintshire Record Office has microfiche copies of the Calendars of Grants of Probate for England and Wales, from 1858 to 1935. Most probate records for Flintshire, for the years prior to 1858, are to be found in the National Library of Wales, Aberystwyth. Indexes, and in some cases, copies, are held in Flintshire Record Office. The parish of Hawarden was an ecclesiastical "peculiar", and had the power to grant probate. The majority of its original wills, administrations and inventories (from 1554 to 1858) are held in the National Library of Wales. An index is available at Flintshire Record Office. Flintshire Record Office holds many records of former British, National, Board and Council schools. Those of most interest to family historians are the admission registers, which were kept from the mid-nineteenth century, giving the names and dates of birth of the pupils, and the names and addresses of the parents. Although a considerable number of these registers have been deposited, some are known to be in private hands. Many log books have also been deposited. These were required to be kept by head teachers from 1862, and sometimes provide information on individual pupils. (Access may be restricted). Flintshire Historical Society, founded 1911. From 1911 to 1976, the Society published a series of annual Publications. In 1978 it became the Flintshire Historical Society journal. Friends of the Clwyd Archives. Clwyd Family History Society. The Society publishes a journal, "Hel Achau", four times per year, and has a resource centre for the use of members. It has more than 1100 members, many of whose "interests" are listed in the "Members Interests" booklet published by the Society. Archdeacon Thomas (1908-1913) gives the area of the parish as 240 acres. Flintshire Record Office holds copies of the Electoral Registers for Flintshire, from 1912. The earlier registers, with a few exceptions, were destroyed during the First World War. When consulting the Electoral Registers, it should be noted that they refer to Urban Districts, Rural Districts and "Civil Parishes", which were created during the late Victorian period - and which, in general, no longer exist. In some cases, the names chosen for these administrative units were those of the old "townships"; but as these were somewhat loosely defined, it is advisable to ask the Record Office staff for advice before searching through the Electoral Registers. This county is maintained with the help and information provided by a number of volunteers.